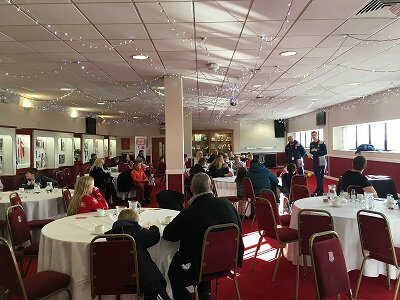 20 families from Stoke-on-Trent visited Stoke City FC this week to take part in a family fun day at the club, as part of our Stoke Reads campaign and Premier League Primary Stars work. We teamed up with the Stoke City Community Trust to welcome families from Stoke-on-Trent to the Bet365 stadium, where they took part in fun football and literacy activities. The children who came along with their families were from six schools in the area, including The Willows Primary School and St John's CE(A) Primary School. The families took part in a football skills challenge, completed football puzzles and word games and were given a behind-the-scenes tour of the stadium. They were also treated to brilliant storytelling from Anna Jones, who works in Stoke-on-Trent City Council’s Little Library Van. The Stoke City mascot, Pottermus, even made an appearance too! At the end of the day, the children got the chance to choose books to take home for free, along with Premier League Primary Stars goodies. Families were also given tips and guidance on reading to their children and using football to boost literacy skills.